Galeria long handle acrylic brushes, manufactured by Winsor & Newton, have been specifically designed for use with acrylic colour. The versatility of acrylic colour places heavy demands on any brush which is why we created Galeria brushes to be strong and resilient, whilst offering flexibility and sensitivity in use. The unique mix of synthetic filaments has been developed to provide artists with perfect control for thicker application of colour and responsiveness, whilst maintaining excellent shape retention. The synthetic filaments in the flats are curved, helping the brushes retain their original shape during use and the rounds offer a good point for delicate linear application. Regardless of the volumes of water used in acrylics, the use of synthetic fibres ensures good shape retention particularly in comparison to traditional hogs. 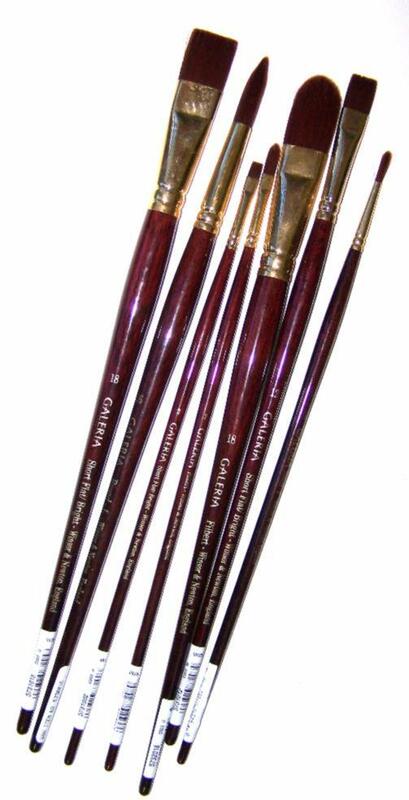 Galeria long-handled brushes are made from stiffer filaments, allowing thicker application on tougher surfaces. The brushes are stiff enough to push thick colour, applying the colour like a spade for specific effects. Available in sizes 2, 4, 8, 12, 14, 16 & 18 in short/bright flat, round and filbert- all with long handles. 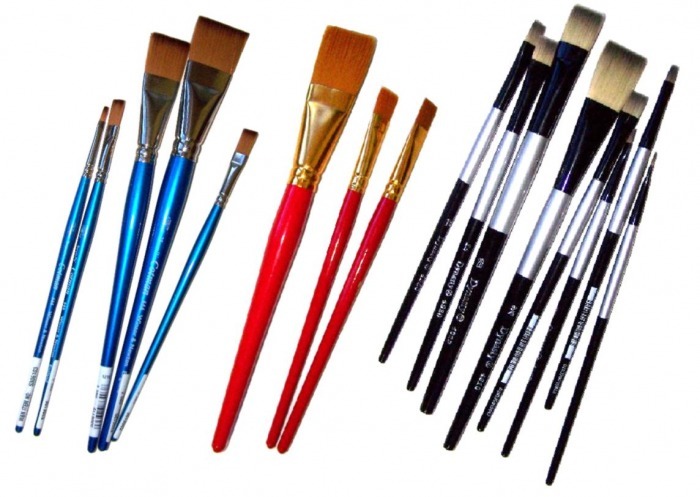 Dynasty long handle acrylic brushes to are an excellent quality, affordable range of long handled taklon brush noted for their flexibility and sensitive tips. The filaments are perfectly set in an interlocking construction ensuring good points on rounds for delicate work and general shape maintenance. Available in size 1 and then even sizes from 2 to 12 in bright, round and filbert- all with long handles. Eve Black-handled Acrylic brushes are a range of superior quality, soft filament brushes with sensitive tips ideal for using when a thinner consistency is required for glazing or a water colour style of painting. They have excellent colour carrying capacity for use with fluid colour. Their filaments, set in a seamless black lacquered ferrule, are constructed in a perfectly interlocking formation for tip sharpness and shape retention. The rounds offer a good point for delicate, detailed work. Available in sizes 2, 4, 8, 12, 14 & 16 in bright and round- all with long handles. The Daler Rowney Cryla Brush range has been subjected to a ground up redesign with new natural coloured, stiffer synthetic filaments which offer great spring while achieving a flawless, smooth finish. The range of head shapes has been widened and the number sizes increased. 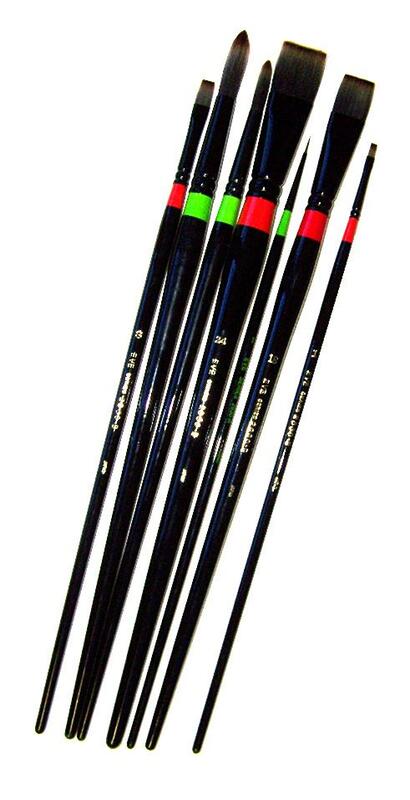 Daler Rowney Cryla acrylic brushes will appeal primarily to the serious acrylic artist and will often find greatest favour when used with artist quality acrylics. Daler has produced probably the best acrylic brush on the market. Click here to find out more about Daler Rowney Cryla Brushes. Dynasty 8300 Series acrylic brushes are an excellent good quality, yet affordable range noted for their tensile strength, flexibility and sensitive tips. Their stiffer filaments, set in a high quality seamless ferrule, allow for robust, thick application of colour whilst maintaining shape. The filaments are perfectly set in an interlocking construction ensuring good points on rounds for delicate work and general shape maintenance. Available in even sizes from 2 to 12 in bright, round, filbert and 4 sizes of fan- all with long handles. 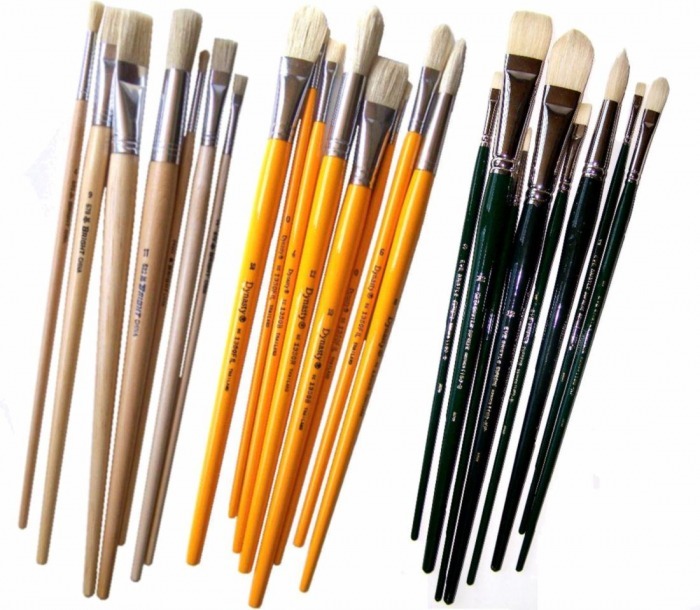 Taklon wash brushes are also a very suitable and popular choice amongst acrylic artists', offering affordability and many of the same properties as traditional acrylic brushes. To see our range of taklon wash brushes, click here. Oil (Hogs Hair) Brushes are also suitable for acrylic artists' preferring a looser, impressionistic style and coarse brush strokes. To see our range of oil brushes, click here.